During Vladimir Putin’s annual Q&A session some members of the Valdai International Discussion Club asked him several questions. How united is the West in its desire to punish Russia? Which EU countries are in favour of isolating Russia? Is this even possible? And what is going on in Ukraine? During Vladimir Putin’s annual Q&A session some members of the Valdai International Discussion Club asked him several questions. How united is the West in its desire to punish Russia? Which EU countries are in favour of isolating Russia? Is this even possible? And lastly, what is going on in Ukraine? Extract from transcript of the session. IVAN BLAGOI (Russian TV correspondent in Berlin): Good afternoon. How united is the West in its desire to punish Russia? Which EU countries are in favour of isolating Russia? Is this even possible? And lastly, what is going on in Ukraine? These are the questions that the Valdai International Discussion Club experts have been discussing. Some of them are here in this studio. Let me introduce them: Alexander Rahr , Germany; Nicolai Petro , USA; Gabor Stier , Hungary; Gerhard Mangott, Austria; and Arnaud Dubien , France. The first to ask his question will be Alexander Rahr, member of the Valdai Discussion Club Advisory Board. Mr Rahr, go ahead please. ALEXANDER RAHR: Good afternoon, Moscow. Good afternoon, Mr Putin. ALEXANDER RAHR: Greetings from Berlin. The Valdai Club members had a meeting that lasted several hours yesterday, and many Club members, including our German colleagues, expressed their concern about the kind of Europe we will live in – in addition to the shared task of stabilising Ukraine, which is falling apart as we speak. After all, it is a country of 45 million people and our common concern. What future do you envision for Europe in five or, say, ten years? Will we live in a common Europe from the Atlantic to the Pacific Ocean? Or will we live in two different Europes? I remember how you said at the Valdai Club last September that Russia is a different kind of Europe, whole values differ from those of the post-modernist West. Can we bring these two views together? What can Germany do to help build a common Europe? VLADIMIR PUTIN: First, good afternoon, Alexander. Second, I’d like to say that there is no contradiction in what I said at the Valdai Club. Russia’s values do not differ dramatically from European values. We belong to the same civilisation. We are different, and we have some features that are unique to us, but we have the same ingrained values. I believe that we must certainly strive to create a greater Europe from Lisbon to Vladivostok, as I have said more than once, including today. If we accomplish this task, we will be able to take our rightful place in the future world. But if we choose a different path, if we divide Europe, European values and people, if we promote separatism in the broad meaning of the word, this will make us all insignificant and mediocre players who will have no influence over their own development, let alone global development. MARIA SITTEL: Berlin, please, one more question from you. IVAN BLAGOI: Yes, Mr Petro, please, your question for the President. NICOLAI PETRO: Good afternoon, Mr President. My question concerns Russia-US relations. The relations between Russia and the United States have worsened to a critical level recently. The US media unanimously speak about total mistrust between the US and Russian leaders. However, global issues still need to be resolved, and this requires closer cooperation between the US and Russia. So my question is: How can the lost trust be recovered? What particular steps are necessary for the US and Russia to transform from rivals to allies in settling global issues? VLADIMIR PUTIN: You know the answer is simple. I agree with you that we have lost trust. But why did this happen? We believe it’s not our fault, because these double standards, as we call them, have always been disappointing. We see a situation in which it’s appropriate to act the way the United States did in Yugoslavia, Iraq, Afghanistan, Libya but it’s inappropriate for Russia to defend its interests. I gave you the example of Kosovo, which is totally obvious and clear to the average person not involved in politics. Everything is being turned upside down. This position is devoid of any logic, any logic whatsoever. We just mentioned that I addressed the European people and other nations directly, because ordinary people can see insincerity. In order to restore trust we need to respect each other’s interests, speak the same language, avoid double standards and lies in international politics, focus on international laws but not on the politics of force, which we also mentioned here. I hope this will be possible. And I can assure you that Russia will certainly strive for this. KIRILL KLEYMENOV: Mr President, you remember the story with a button that Ms Clinton gave to Mr Lavrov as a gift? The “reset” inscription on the button was translated into Russian with a mistake, as “overload” rather than “reload.” An overload is what eventually happened. 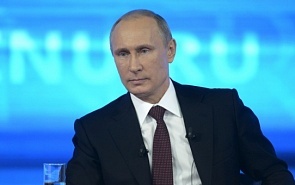 VLADIMIR PUTIN: You know, it didn’t happen just now because of Crimea. I think it happened much earlier, just after the events in Libya. Dmitry Medvedev, who was Russia's President at the time, supported our western partners and upheld the resolution on Libya. This was about a ban on flights of Libyan government air force. The actual result was air bombing, the overthrow of Gaddafi, his murder and the murder of the US ambassador, and the collapse of the country. This is where mistrust comes from. This is how the “overload” happened. But I would like to emphasise this once again. Russia is interested in improving relations with the United States and will do whatever is necessary to restore trust. KIRILL KLEYMENOV: We can take one more question from Berlin. Ivan, go ahead. IVAN BLAGOI: Mr Stier, your question, please. GABOR STIER: Good afternoon, Mr President. We are witnessing now not just a reframing of the world order, but a reframing of views. We are witnessing a conservative renaissance in Russia. In many European countries, traditional views are gaining ground; from Hungary to France, people vote for politicians who defend the national interests of their countries without looking constantly to Brussels. This approach is not always appreciated in Europe. What do you think, will it be possible to build relations, to build a dialogue between Russia and Europe based on interests? Aren’t you afraid that the United States could damage the Russia-EU relationship for a long time to come? VLADIMIR PUTIN: We, in any case, are not seeking to damage relations with Europe, and I hope our European partners are not planning to either. As for the rethinking of values in European countries, yes, I agree that we are witnessing this process. So-called conservative values are acquiring a new significance. I spoke about that more than once. The victory of Viktor Orban in Hungary, the success of the conservative forces in the latest election there, the success of Marine Le Pen in France (she came third in the municipal elections), the growth of such trends in other countries is obvious. As I see it, this is associated with the desire to strengthen national sovereignty, with the realisation that some issues that are vitally important for citizens can be addressed more effectively at the national level than, say, in Brussels. But there is also an understanding that it is important to join efforts to deal with some challenges that concern everyone. But a certain reframing process is underway indeed, and I hope that the results will be positive. As for our relations with Europe and western countries, I have mentioned before that this is an issue of trust. In fact, you also spoke about it. You know, this is very important, this is a vital issue – trust on both the personal and intergovernmental level. You know what came to my mind? The current Secretary General of NATO, Mr Rasmussen, used to be Prime Minister of Denmark, a wonderful country with wonderful people. We have excellent relations with Denmark, at least that has been the case so far, and I hope it will remain so in the future. When Mr Rasmussen was Prime Minister, he once asked me to hold an unplanned meeting. I agreed and we met. It later turned out that he had recorded our conversation and then published it. I could not believe my eyes and ears. Sounds unbelievable, right? He explained that he recorded our conversation for history. All right, I’m flattered, but even for if it was for history, shouldn’t he have at least warned me or asked my permission to publish those talks? How can we speak of trust after something like that? You see, relationships – whether between people or governments – should be more stable, transparent and collaborative. MARIA SITTEL: Berlin, thank you so much for your participation and your questions. Stay with us; we will continue to discuss international issues in our Moscow studio.